Mid-century modern furniture has become hugely popular – Secret weapon websites for retro cool design at warehouse prices. Los Angeles, CA (PRWEB) October 10, 2006 – The Mid Century retro modern furniture movement has taken center stage in the world of design furniture today. In recent years, mid-century modern furniture, glass, ceramics, and textiles have become hugely popular among those who appreciate the stylish contribution these pieces make to contemporary homes. At the close of World War II the US was electrified with optimism about the future. America began a love affair with fashionable living in a post atomic world. Kidney shaped tables, boomerang sofas, and amoeba forms are the hallmarks of this distinctive 1950’s furniture style. Retro modern chic is characterized by space age materials, innovative biometric designs, and trend setting colors. The leading architects of this school include Ray and Charles Eames, Harry Bertoia, Arne Jacobson, Isamu Noguchi, and Eero Saarinen among others. A Google search indicates that the foremost source for mid-century furniture is Gibraltar Furniture, which features retro-modern and a wide array of discount architectural modern, high quality items at discount prices. Gibraltar Furniture is one of the leaders in the world of Internet modern architectural products. Gibraltar sells both original and reproduction furniture manufactured in Italy, America, and Asia, with original specifications, exceptional qualities, and the finest selections, at cut-rate prices. Gibraltar offers the classic Noguchi Coffee Table for only $545, whereas Knoll sells this piece at Design Within Reach for $1,195. Similarly, an Eames Lounge Chair and Ottoman will set you back $3,125 at DWR but wholesales for only $1,599 at Gibraltar. 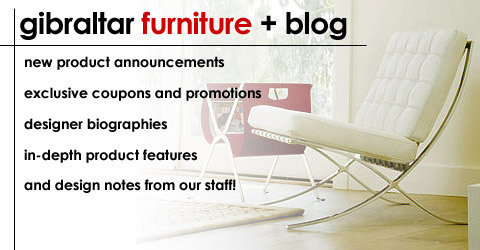 Located at www.gibraltarfurniture.com and (800 416-3635), this West coast company has been in operation for over 50 years. Gibraltar is based in Beverly Hills, 90210, and is an insider secret weapon for cool merchandise at warehouse prices. This supplier is an excellent resource for factory-direct pricing on all mid-century pieces, and offers designs by Wright, Bertoia, Saarinen, Jacobson, Nelson and Kjaerholm, at cut-rate prices. With roots in prewar Germany, modernism leaped to popularity in postwar America. Early advocates included architects Ludwig Mies van der Rohe and Walter Gropius. Incipient modernism blended functionality with frugality. Between 1945 and 1960, architects like Frank Lloyd Wright and designers like George Nelson revolutionized the home furniture landscape and helped create the template for the modern retro look. Baby Boomers and Generation X consumers are clamoring for postwar pieces that are still breathtaking and beautiful due their clean and chic lines. Modern architecture was a direct rebuttal to the busy neoclassical styles that came before. Retro modern furnishings feature styles such as low-slung sofas and ovoid glass coffee tables that spotlight asymmetrical and free-form shapes. Huge advances in postwar polymers, injection molding techniques, and machine techniques helped designers fashion unique products that previously were unimaginable. That lime-green Egg chair of grandma’s – which you thought so hideous as a child – would now be snapped up in a second by a savvy collector. Modern Retro is not about slavishly recreating a period feel. Instead, it encompasses the best designs, eclectic forms, colors, and patterns. In addition to classic designs, Gibraltar is introducing a new series of innovative furniture products that take their inspiration from mid century schools of design. Companies such as Jet Age and Lunar Lounge Design are creating exciting new items in the retro cool tradition.